A sustainable packaging company based in Auckland, New Zealand. Specialising in recyclable, commercially compostable & photodegradable food packaging made from Stone Paper. Stone Paper is the future of sustainability and practicality in the food packaging industry. Our Stone Paper is FDA certified food grade. Naturally greaseproof, waterproof and incredibly durable. It's also 100% recyclable and has achieved the prestigious and world renowned New Zealand Environmental Choice tick in 'Packaging & Paperboard'. Food packaging is inescapable in our lives. It's the number one form of packaging used on a daily basis. Cups, plates, bowls, noodle boxes, burger wrappers, takeaway bags, fish n chip paper - the list goes on. The public are more aware than ever of the unacceptable amount of waste that occurs as a result of food packaging. It is imperative that we start disposing of food packaging in a responsible manner. We believe that we have the solution to this problem - a product to revolutionise the food packaging industry. Stone Paper’s performance is unrivalled in these three key categories that must be considered by any business; upstream environmental sustainability, product effectivity and most importantly, waste management. The point is simple, our Stone Paper products are 100% recyclable. The reason this is so important is that recycling is a system already well and truly activated in our society. Every household, store, business and school already have a recycling bin sitting right beside the general waste bin. Convenient right? Coupled with Stone Paper's far superior sustainability practices in the production process and unique product qualities (greaseproof, waterproof, durable etc) we can confidently say that this is the best all around choice for your business. Pulp paper or kraft paper can only be recycled 6 or 7 times, and each time it requires 30% virgin paper fibres to be added, making a bad option worse. Should the paper absorbe any grease, it can not be recycled at all. Bio plastics and various plant based options may seem good on paper (excuse the pun), but they can’t be recycled because they are made of various compounds that are unable to be separated into their rightful recycling streams. Sadly, as a result, they end up in landfill more often than not. Some of these bio plastic products promote that they can be commercially composted. To an extent this is great, and Stone Paper is proud to also be both non-toxic and commercially compostable. However, commercial compositing is simply an unrealistic waste disposal strategy. This is due to the fact that in nearly all normal situations there isn’t a bin awaiting transport to the nearest commercial composting facility - of which there are very few. People need an accessible means for disposing of their rubbish. The best way that this currently exists in our society is via recycling. How exciting are these innovative designs?! 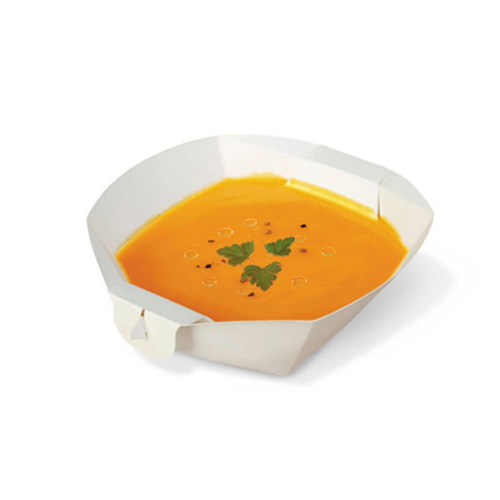 These are examples of some of our favourite Stone Paper take away tapas packaging. Made without glue, this is Stone Paper at it's best, making use of it's natural waterproof nature to create leakproof packaging for such a wide range of food. Our zip lock pouches are 100% recyclable unlike most foil/paper options, with incomparable environmental upstream benefits. See our specific product pages for more details. Here you can see some food packaging other peoples designs we love. All of these can be made out of Stone Paper... you just have to think outside the square. *Examples above are not our work, but design work that could easily be implemented with Stone Paper technology. Put your mind at rest; our stone paper is 100% non-toxic and FDA certified food grade. Stone Paper is FDA Compliant for the code of Federal Regulations with respect to soluble and extractable matter as an environmental paper and food grade suitability. Let's start the conversation and get this show on the road!